Martin Keith guitars include a number of unique and useful features and details. The player can adjust the action in a matter of seconds, using a simple 1/8” hex wrench. This adjustment can be done with the guitar up to pitch — in fact, most adjustments do not even require re-tuning! The neck can easily be removed for maintenance, repair, or even travel. In fact, the whole guitar can be "field-stripped" down to its basic component parts in about 5 minutes, with just the single hex wrench. Finally, the adjustable neck lets me fine-tune the response of the guitar. By varying the bridge height, I can control and adjust the amount of load on the top, and find exactly the right amount of pressure to make each guitar work its best. This can be done after the guitar is assembled and finished, a time when most guitars are already fixed to a given geometry. Traditional guitar designs position the fingerboard extension directly against the top, with a glued joint. This is one of the most stressed areas of the guitar body, and one of the most likely to move with weather, resulting in a fingerboard with upper frets that are out of plane with the rest of the neck. The rotational stresses on these traditional neck joints also can cause catastrophic failures and splits in the top. My guitars feature a cantilevered fingerboard extension which “floats” above the surface of the top. 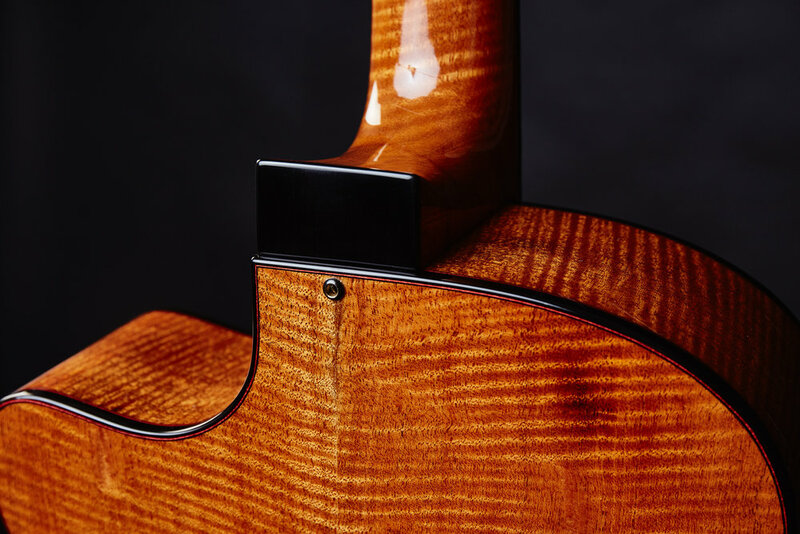 The extension is supported by a carbon fiber structure which is anchored deeply into the neck material, guaranteeing a straight, true playing surface that will not shift with weather. This design also allows for lighter, more responsive top bracing in the soundhole area. The zero fret design goes back to the mid 20th century, and has only recently been rediscovered and adopted by modern custom instrument builders. I am a strong believer in the zero fret concept and include them on every fretted instrument I make. -Open and fretted notes ring from the same material, which makes for a much more uniform and even tone in lower positions. -Intonation is improved, since the critical string height at the nut end is always perfectly in plane with the frets.